A solar panel array that costs thousands of dollars is hardly an impulse buy. Making a financial transaction as smooth as possible is a good goal when you’re selling coffee grinders or candy bars, but solar is a much longer sales and delivery process, and it takes a lot of warm fuzzies to close the average sale. Very few deals will be made without personal interaction between the customer and a company representative. However, much of the work that solar sales reps have traditionally done over the phone and in person–being chummy, educating the buyer, describing options–can be done very well via website, so building a good one can tangibly free up more than half of the rep’s facetime. Oddly, few in the solar business do this well, for various reasons that aren’t really relevant to this post. 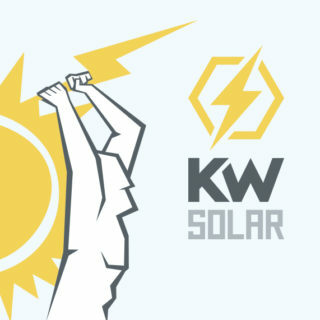 The KW Solar website must initially convey a bunch of positive things to the user: that the company is competent, trustworthy, and likable. If the interaction with the site is fun, users will stick around. They’ll get positive feelings for the company, which makes them much more likely to buy. And if done right, they’ll get the distinct impression that nobody is more capable of delivering a good solar energy system than KW Solar. The experience relies on a high production value throughout. The brand is high-impact. The format is fluid and accessible. The color scheme and layout are ergonomic and approachable. The quality of the site conveys that this company has its act together. The dialog is folksy and fun. Readers get the impression KW loves what they do, and are good at it. As a customer, it’s hard not to get sucked in to a company’s culture when its people have so much fun at work. Are the panels waterproof, or will they die when it rains? How long will the system work? Do I still get a power bill? Now, some say there are no stupid questions, and for an “emerging” technology it’s perfectly understandable that people would be asking these sorts of things. But it is a little crazy that a well-paid sales rep has traditionally been expected to answer these questions–in person–every time they’re asked. We got the bright idea to delegate the answering of said questions to text on a computer screen. 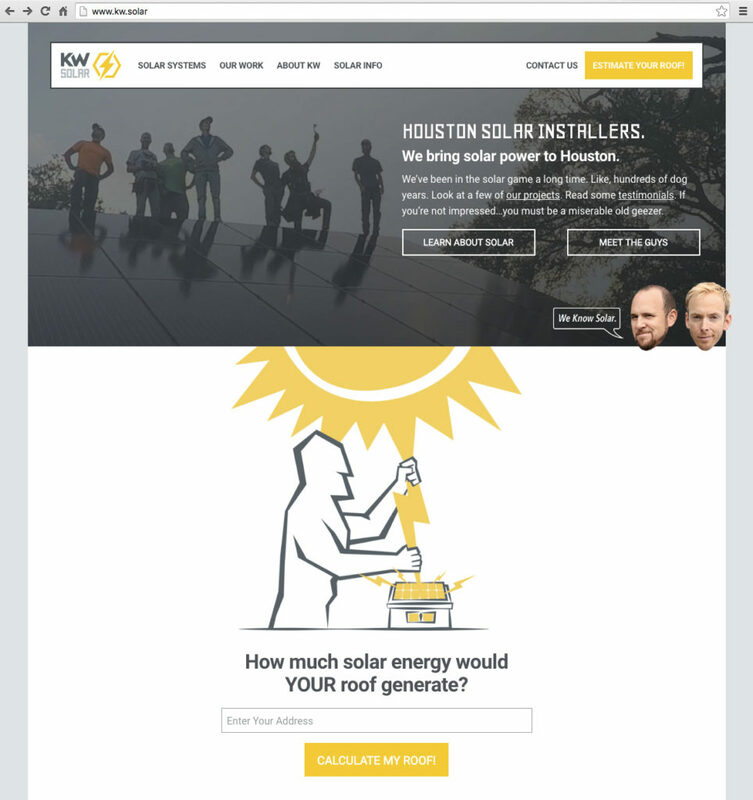 It was so effective to simply publish information about solar, that we wound up extending it from a simple FAQ into a full-blown knowledge base, which is integral to the main site. Topics are formatted in short snippets as one-or-two-paragraph answers to fairly straightforward Questions. Of course we call these the “frequently asked questions”, and they look very much like any FAQ section out there. But rather than stick them in a cool slidey thing, we made each a uniquely loading page, so they could be linked together topically. Some topics in the solar world can’t really be discussed in one or two paragraphs, so we implemented a second format in the knowledge base–topical articles. These follow a more comprehensive, freeform structure, and are much longer that the FAQs, but also cross-link to relevant pages. This method allows users to quickly access information based on their question, and encourages an organic, choose-your-own-adventure browsing experience that universally satisfies the inquisitive visitor. Additionally, the knowledge base is keyword rich and highly relevant to our topic. So it’s instrumental in getting us organic web traffic! Segregating our knowledge base into two distinct formats also facilitates further development of the content, as adding and revising content can be done surgically and rapidly. Obviously, one of the most common questions prospects ask is how much the system costs. It’s very easy for a sales rep to give a rule of thumb, such as “about $3 per Watt”, but of course this doesn’t mean anything to the vast majority of people. To give a close cost estimate, one must ascertain the prospect’s power consumption in order to adequately size the solar array, and that can require some time and a fair amount of information that the buyer doesn’t always have on hand. And because solar power systems tend to run in the tens of thousands of dollars, sales reps often hold out on naming a price as long as they can, to avoid giving sticker shock. But an interested caller who can’t afford a system can’t afford it at the end of a half-hour conversation any more than they could at the beginning. And all these calculations, while fairly involved, are not complicated. In fact, machines are better at making them than people are, and machines don’t get bored doing it. 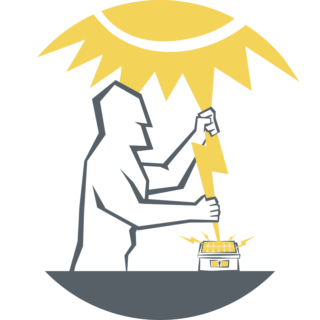 We designed a calculator–we call it the Solar Wiz–that gives site users an idea about cost, production, and energy savings over time, as quickly as possible. 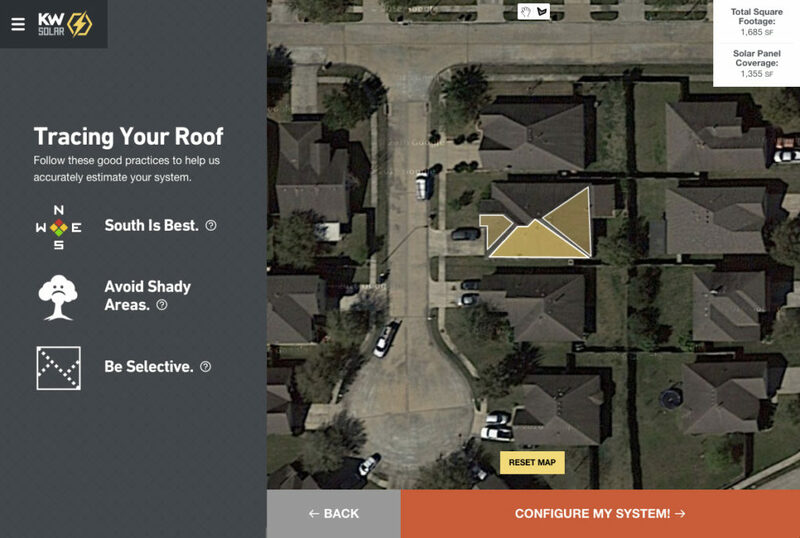 Prospects punch in their address and see their roof via the Google Earth satellite. Using an ergonomic little interface, they designate the parts of their roof where they envision solar panels going. A measurement is made to ascertain how many panels their roof will accommodate. They punch in a few more simple values and see an entire breakdown of the system’s cost and performance. If they’re still interested after seeing the economics, then we’ll put a sales person in front of them. The Wiz acts as both funnel and filter for web traffic, advancing prospects down the sales pipeline with no human interaction until they’ve been highly qualified. It gives the visitor quick, comprehensive answers to their questions at any time of the night or day, placating non-buyers, giving them a valuable experience, and sending them on their way without spending a second of the sales people’s time.